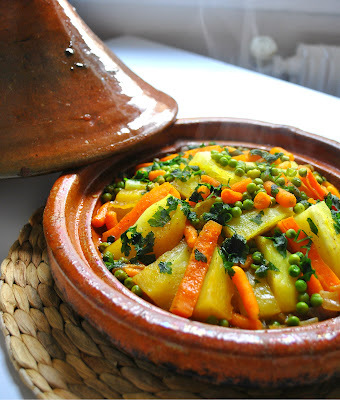 This is another Moroccan favorite tagine recipe. You’ll be surprised how Vegetables will taste so different, appetizing, fresh and tasty when cooked in a Moroccan Tagine. Pour half of the oil into the bottom of the tagine without preheating, add in layers: onions, carrots, potatoes, then arrange tomatoes on top, sprinkle green peas and chopped cilantro as a garnish. Decorate with olives and preserved lemon slices. Mix all the spices in a bowl with some water , pour over the vegetables, add the water from one side of tagine (not from the top to not wash the spices out), cover and let cook over low-medium heat for about 30 to 35 min or until vegetables are tender. It’s important to baste the vegetables from time to time to prevent it from drying and to keep the flavor throughout. Drizzle the Tagine with the rest of the oil prior serving, and enjoy hot with some bread, the traditional way.